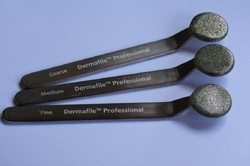 Dermafile™ is a skin polishing and resurfacing tool made of stainless steel and finely crushed cosmetic diamonds. This file will lightly polish the skin by hand, removing the top layer of dead skin cells, and leaving velvety smooth, fresh, rejuvenated skin. Dermafile™ is a very effective tool for treating aging and sun damaged skin, scars, acne scarring, pigmentation, stretch marks, fine lines and enlarged and clogged pores. • Helps build collagen and smooth fine lines. • Skin feels silky smooth and clean! Schedule your appointment today and say, HELLO to your new best friend!